Worthing have been handed a boost in their race to secure a Bostik League Premier Division play-off place. Adam Hinshelwood will have a near-full-strength side to choose from ahead of the trip to Bishop’s Stortford on Saturday. That’s after versatile Alex Parsons served the final match of his four-game suspension in the 3-0 defeat at newly crowned champions Dorking Wanderers last time out. And with Worthing sitting fourth in the table with four games to go, Hinshelwood believes the midfielder’s return will hand his team another boost. Yet Parsons could face a fight to get back in the side after a fine recent run of results in his absence. Hinshelwood said: “We’ve had a session analysing Saturday’s game and are prepared for Bishop’s Stortford. “We’ve got Alex back from suspension now so its looking good. We’ve won three out of the four games he’s not been involved in, so it might not be easy for him to get back in to the squad. Worthing sit fourth at present, with two points between them and Leatherhead, who sit outside the play-off spots. But Hinshelwood is not placing any pressure on his side. The former Brighton defender just wants to see his troops continue the form that has got them into this position. But he admitted they’d have to perform at a higher level at which they did in the defeat at Dorking. Worthing face Bishop’s Stortford, Tonbridge Angels and Merstham – all teams currently in the top eight – in three of their remaining four matches. The remaining game in the run-in comes against relegation-threatened Corinthian Casuals. But Hinshelwood is refusing to look any further ahead than the test at Bishop’s Stortford on Saturday. “It’s going to be a tough run-in but we won’t worry too much about that just yet, all our efforts are focused on Bishop’s Stortford,” Hinshelwood said. Worthing have won 11 of 19 games on the road in the league this season. 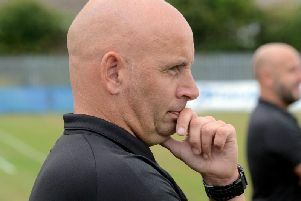 And Hinshelwood feels having a strong away record can prove to be a driving force in the closing stages of the season.